HUGH HEWITT: Morning glory, and bonjour. Hi, America and Canada. It's Hugh Hewitt in the ReliefFactor.com Studio, inside Washington, DC. Back from my son's wedding in Maine. And I am back in time for the Kavanaugh hearings. And I thought it would be best if we both began the week and ended it with Dr. Larry Arnn of Hillsdale College fame. Hillsdale.edu for all things Hillsdale. A special Hillsdale Dialogue. I usually do this on the third hour on Friday. I'm doing it on the third hour on this Tuesday because of the Justice Kavanaugh inevitability, and what that means, and how important it is. Because the Hillsdale Dialogue is always about big picture. It's always about big issues, big intellectual crises, big times and turns in American and world history. And Dr. Larry Arnn, president of Hillsdale College, joins me. Good morning, Dr. Arnn. How significant is this week? LARRY ARNN: Well, we might have ourselves the Supreme Court that supports the rule of law. There's nothing bigger than that. HEWITT: There is nothing. I tell people my whole life has been-- public life-- has been dedicated to the rule of law, and getting a stable Supreme Court majority that is originalist. It's my end game goal. And I think I'm this close, Larry Arnn. ARNN: Yeah, that's right. This guy's not a wild man. He's reserved. And I don't mean just he's reserved in what he says. There's a lot of record from this guy because he's been a judge for a long time. And, you know, on the one hand, the administrative state, with its combination of executive, judicial, and legislative powers in agency by agency, that's a very questionable thing. Indeed, that's maybe the key. Because the delegation of the legislative power. People elect people to make their laws. And all government starts with the making of laws. And the Founders believe in the clearest possible terms that it's up to them. So they let somebody else make the laws deputed by them. It breaks up accountability. And so that is a very questionable thing. And it's the reason we can have so much big government. And Kavanaugh, on the one hand, seems to have an understanding of that. And on the other hand, he doesn't think it's the job of the court to unmake all of that by itself. HEWITT: And he is right in that. There is an article in The Washington Post that ran on Friday. I was asked to participate in a collection of people. What is his most important decision? And I was the only one who came up with Otay Mesa Development v. the Department of the Interior. And it is an endangered species case in which he threw out the decision of the Department of the Interior US Fish and Wildlife Service without even a look over his shoulder. Because it was so stupid. And that flies in the face of Chevron deference, which is inimical, as you point out, inimical to what the framers had in mind. ARNN: That's right. Think of this. The independent judiciary, that's something that Kavanaugh likes to say. What does he say? He's for three things. I think he says rule of law, the Constitution, and independence of the judiciary. Well, the independence of the judiciary is just this simple thing. You've got these judges. And they occupy a kind of passive role. They wait for a case to come to them. People have to bring it. It's usually about something that happened a long time ago. ARNN: And the only power they've got is to decide that case. So they're not like the Congress. They're not all upset about the day's news and deciding what they're going to do about it. Or at least they can't say anything about that. And they're not like the President, taking action all the time. They judge things after the fact. But that turns out to be crucial. Because these people who do have all this active power in the executive and legislative branches, they can't do anything to you. You know, Joe Blow and Jane Doe, they can't do anything to you unless this independent person says they may. And that's the heart of the matter. Heads rolled in England for 150 years to try to get that established. And now you've got-- you know, take Hillsdale College in 1984-- no, 1979 is when that part was. We were assailed by the Department of Health, Education, and Welfare. Got to abide all these regulations if your students get these loans from the federal government, which was styled as aid to the students, not to the college. So they threatened to shut us down. They prosecuted us. We had to sue them in front of an employee of theirs-- not a judge, no-- somebody who's on the payroll of Health, Education, and Welfare. And that's the way it works. And Chevron deference comes from a court case-- as you know better than I-- and Chevron v. Natural Resources Defense Council, old friends of yours, Hugh. ARNN: And that case says the judges in the Supreme Court of the United States are going to pay deference, they're going to listen very carefully and be reluctant to overrule anything these administrative judges say. HEWITT: And when people-- by the way, people will say it's unanimous decision in 1984. That's because Rehnquist and O'Connor, who would have been hell on wheels on this, were recused, as well as Justice Marshall. It's a six-person decision of Blackmun, and Powell, and Stevens, and Brennan, and White, and Burger. So it's an old decision. And it did not have originalism in it. ARNN: That's right. Yeah, because, you see, a lot of this stuff, the ideas that lie behind this growth of the administrative state, started in the 19th century. It is an old thing. But it only actually got control of the government in anything like a complete way in the 1960s. And if you just go look at the architecture of Washington, D.C., you can see when it happened and where it happened, because they built a bunch of ugly buildings. ARNN: And so in the '60s, this thing springs before the eye entire. And you can see it. And it takes a long time-- and in your line of work, in legal education, and in the law, and lawyers, and judges, a lot of thought intensifies about this. What about this? Is this the way to make the law? Is this permitted? Because one thing about it is it does treat this Constitution of the United States as a malleable thing. It changes with time. And so the people-- there have always been judges. And there have always been law professors. And there have been lawyers who claim that the law is written down specifically so that it can mean the same thing tomorrow as it means today. But that's become better organized now. And so that has produced a movement, you know, expressed in lots of things-- you're a member of the Federalist Society and stuff like that. HEWITT: I'm not a member because joining it would make it impossible for me to cover it. So I don't want to ever have to say I'm recused from this story because I'm a member of the Federalist Society. So I have never, ever joined it. But boy, do I applaud it. HEWITT: Let me let me read to you from Brett Kavanaugh's opening statement released from the White House, quoted by Anne Rumsey Gearan on Twitter. "A good judge must be an umpire, a neutral and impartial arbiter who favors no litigant or policy-- ellipses-- I don't decide cases based on personal or policy preferences." Close quote. What do you make of that? What does it echo? Anyone else come to mind who made that statement? John Roberts, right? ARNN: That's right. That's right. So yeah, you've been saying that. And I think that's artful. There's something about the temper of this guy that seems like Roberts. And one of the things they said when Roberts was up for confirmation was it's so hard to lay a glove on this guy. He's been so concealed. But I don't think that's what it is. I think that these are just very careful people. HEWITT: And they're very, very smart. And won't be rushed. And they won't be emotional. And I think Roberts-- I could say it, and I know him. I don't know Brett Kavanaugh. I've never met him. But I think you could say the same thing. If you live in Washington, D.C., you develop the ability to sail your ship in stormy waters for a long time without running into anything. You just learn how to do it. ARNN: That's right. Yeah, I mean, we were talking about Trump in the break. And there are lots of people-- well, there are dozens of people, let's say, who live their whole lives thinking they're going to be elected president of the United States. And they start when they're 32. And they organize everything for that. And then there's somebody like Trump. There actually isn't anybody else like him. He just up and did this thing. He thought about it. But he hadn't lived his life that way. And so it makes a mess. Well, this guy's experienced. There's no mess here. HEWITT: He lived his life waiting for these four days. HEWITT: Right? He has lived his life, and he did his career. And that's OK. Some people aspire to be judges. I don't. I can't imagine actually being a judge or a justice. But I mean, I clerked for a judge. And of my 35 years as a lawyer, it was the most boring year. Because it's just boring. ARNN: And remember, I don't think this guy or Roberts were campaigning for the job. I think they were just trying to be good lawyers and judges. HEWITT: They were. And they are temperamentally disposed to sit there and think, and think, and think, and read cases. I can teach because I can talk. But you can't talk if you're a judge. HEWITT: Isn't that terrible? You and I, our heads would explode, right? We could not be judges. We would be like balloons. Eventually we would just get so large it'd be like the Macy's Day Parade, and then we would burst. 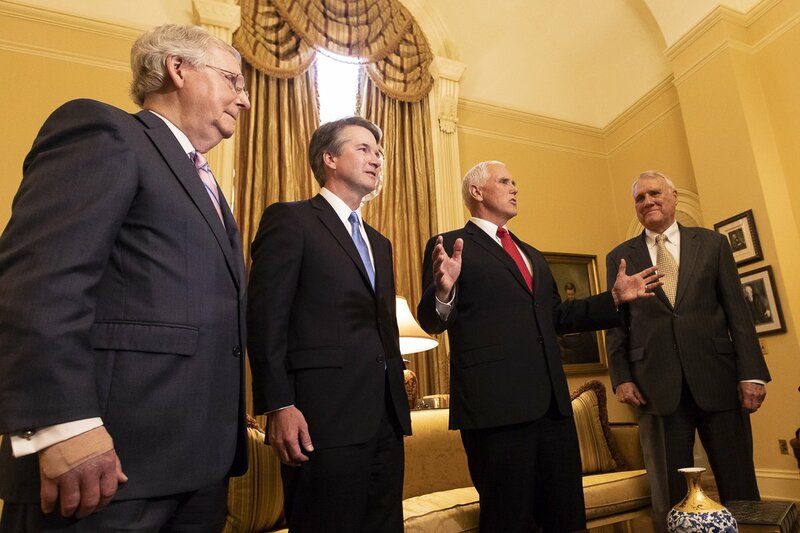 I'll be right back with bursting Larry Arnn on this, the first day the Kavanaugh hearing, in the Hillsdale Dialogues Special Edition here on the Hugh Hewitt Show. 21 minutes after the hour, America, from the ReliefFactor.com Studios. It's Hugh Hewitt with Dr. Larry Arnn of Hillsdale College, where he presides. He is the president of Hillsdale. All things Hillsdale are found at Hillsdale.edu. All of our conversations, stretching back to 2013, are collected at HughForHillsdale.com. We're talking in a special edition of this because it's the opening of the Kavanaugh hearings today. And at the end of the week we'll talk about what we learned if we've learned much on Friday. And my question would be, Dr. Arnn, I want to know what your question for the nominee would be. And I had posed this to Senator Sasse. Dred Scott, Plessy v. Ferguson, Korematsu, three worst decisions in Supreme Court history. What leads a court to go astray? How would you answer that? What is it about those three cases that led the court into making-- I call it the Triple Crown of Stupidity. But why did they do it? ARNN: Well, these are big issues, right? And there's human frailty. So of those cases, Plessy is my favorite. Because there's this brilliant dissent that's very interesting. And, you know, there was somebody on the court who wrote an enduringly famous opinion, which is beautifully written and powerful. HEWITT: Yeah, the first Harlan. ARNN: And he, in the badges and incidents of slavery is what these discriminations are. One of the things is it took something bold to do the straight thing. And it had to overcome. Because, you know it's one of the tragedies-- there are many-- but one of the tragedies of American history is that it is the first place ever born in opposition to human slavery. Because that was the fact at the time of the founding. And they abolished slavery in most of the union, about 60%, over the course of 100 years. Because that's how long it is until Plessy v. Ferguson. Over the course of 100 years, we became wedded to that institution. And that was a change of doctrine, and what the meaning of the country was, and what the meaning of the Constitution was. And that got installed. And so what they needed to do in 1896 was-- am I right about that year? HEWITT: Yeah, I think so. It might be 1899. I can't remember. Go ahead. ARNN: And what they needed to do that year was say, it's obvious, right? These are citizens. And these are public places. And they can go where they want to. HEWITT: And that's what the 14th Amendment was about. And it's 1896. We're both wrong. 1896, there you go. And Korematsu, Larry Arnn, they had dissenters as well, including Justice Jackson, one of my favorite justices, and others saying no, you can't take American citizens out of their home and move them to relocation camps. There were dissenters, I believe, in Dred Scott. So there are all these people who see the right thing, the truth thing. But what is it that you think binds-- I mean, these are not stupid people. Felix Frankfurter upheld Korematsu, for goodness' sake. Hugo Black did. These are not stupid people. And Dred Scott-- Taney was not a stupid man. Though he was a racist and a slaveholder, he wasn't stupid. What leads judges off of those cliffs, do you think? HEWITT: Oh, I've got tears in my eyes. Because that's the only-- on this radio show, would you hear that ever said. And we know that our audience gets it. OK.
ARNN: Here's what he writes in his majority. It was a 5-4 decision. And there are dissents and concurrences all over the place. There's no unity on that court in Dred Scott. And here's what he writes. He writes that the fact that the founders wrote the Declaration of Independence and held slaves is proof by itself that it did not include the slaves. HEWITT: And that was Abraham Lincoln's case in the Cooper Union speech. OK, you're right. He was stupid. At least in that decision, he was stupid. I'll be right back, Dr. Larry Arnn and I, on Kavanaugh Day One. The hearings commence in a couple hours. Don't go anywhere except here for your analysis on the Hugh Hewitt Show. Welcome back, America. It's Hugh Hewitt in the ReliefFactor.com Studio inside of the Beltway. I'm joined by Dr. Larry Arnn on this, the first day of the Kavanaugh hearing. He will be back at the end of the week to summarize what has happened. Now, I expect Democrats on the Judiciary Committee to ask questions, Larry Arnn, that are controversial questions. To bring up, for example, Nike's decision to hire Colin Kaepernick to, quote, "honor and celebrate his willingness to, quote, sacrifice everything for their new Just Do It campaign." Or I expect them to ask about Black Lives Matter, about Robert Mueller, et cetera. So what is your advice to Judge-- not yet Justice-- Kavanaugh about incendiary questions? ARNN: Well, as a judge, and in these hearings, that's actually none of his business. You know, what do judges have to say about that? In fact, it's essential to their office that they decide the cases in front of them, and they don't take positions on things that might be cases until they get there. And so, if I were he, I would avoid them. Because of what we were saying earlier, Hugh, Brett Kavanaugh is probably an infinitely more cautious man than either one of us. HEWITT: Yes. That is exactly correct. So you just would say, again and again. And it really is a test of your discipline that that is not an appropriate subject for which a justice-- a potential justice-- ought to opine. HEWITT: That's just it. And they can rage. But you just stop. And you don't have to fill the time. You don't have to filibuster. You just say that's not an appropriate subject on which a future justice ought to opine. ARNN: And it's interesting how frustrating that is to-- because if you just look at the statements of Chuck Schumer, the conservatives and the Republicans in the Congress have been, to my reading at least, so far more cautious. Although they're not always. But Schumer, he's just-- he will say that specific policy issues are what are at stake here. And, you know, that's just not clear, right? Because if you and I are-- let's say you and I are running for Congress. And people say, how are you going to vote on abortion? Well, we can answer that question, right? ARNN: In fact, we're required to by the office that we seek. We're going to represent somebody when we do it. But the truth is, how you vote on abortion when it comes to the Supreme Court of the United States depends on a whole bunch of things, many of which will be peculiar to that case. And part of the reason for that-- not all of it-- but part of the reason for that is courts do and should proceed by respecting precedents. And there are precedents here, right? And so this is not the kind of man who's just going to run riot, overturning precedents. And now having said that, I also say this and think this, I think that what we've got today in America is two sets of precedents. And they're both old. And they're both long. And the more recent one is now getting on for as long as the original one was. And so in the end, the court is gradually and over time going to choose between one of those two sets of precedents. And how it finally chooses about that is not all hinging this week in a vote on Kavanaugh, although this is a very important moment. It hinges on the direction of the country over time. Because the court ultimately is shaped by the political direction of the country over time. HEWITT: You know, it is almost 100 years since the court ruled in Village of Euclid, Ohio v. Ambler Realty that zoning was constitutional, even though it diminished the property value of those who were not zoned to the highest and best use and that that was not a taking that required compensation. I date the rise of what you're talking about to that. I'm one of the rare people that say that's as significant as it is. But to me, the moment you cut property rights out and you start to tell people what they could and could not build on other than common law nuisance is the day that the administrative state started to rise. HEWITT: Because they don't have to pay for what they do. ARNN: And see, that zoning stuff was explicitly copied from the German law, right? Where historicism in general was born. And we have our friend and great man, 50 years of law professor, Rich Epstein, who's written at huge length about this. And the tools to protect the public interest from abuses of one's property rights are very rich and very old in the common law. And we don't need this new system of bodies of regulators and stuff to plan everything, and multiply the expense, and let the neighbors decide. You don't have to have that. And you can have Houston. Houston doesn't have zoning. HEWITT: The largest un-zoned city in the United States, which we are talking to right now, the fourth largest city does not have zoning. ARNN: That's right. And if you go drive around in it, it looks like other cities except that… Well, for example, they don't build slaughterhouses next to kindergartens. HEWITT: Because that would violate the common law of nuisance. HEWITT: You cannot bring your rights to the nuisance. And you can't bring your nuisance to the rights of your neighbor. I mean, it's not hard. But they did invent, and they have invested with incredible power, a 2 million strong bureaucracy at the federal level, and many times that large at the state and local level, of people who are invested in the idea of the state having authority because they make money. That's their livelihood. ARNN: That's right. Let that case stand for a host of such things, and what you've got is a centralized, regulatory state making detailed rules that govern local things. HEWITT: And I am hopeful. You are stressing that the court will act prudentially, and I believe it will-- on almost everything. I hope it puts aside prudence when it comes to property rights. I hope it goes back and says we have tried the slow way in Lucas. We have tried to return people the right to control their land 100 different ways to Sunday. And it doesn't get down to the bureaucrats. So here's the bottom line. If you diminish value, you pay for it. I hope they move radically on that, Dr. Arnn. ARNN: Well, that would be the prudent thing to do. HEWITT: OK. I saw what you did there. Let's go listen to what the other side is saying, and have your comment. Brian Fallon, who was Secretary of State Clinton's campaign spokesperson during the 2016 election against Donald Trump, took to CNN yesterday to talk at length about these hearings. Cut number two. FALLON: Well, this process that will take place this week is a sham before it even gets started. And really, you have to go back to how Kavanaugh was selected in the first place. This is really the first time that you've seen a Supreme Court nominee put forward after a president named explicit litmus tests that he would apply in terms of who he was going to pick. Donald Trump was very clear he'd only pick people that would overturn Roe. He wanted a judge that would gut the Affordable Care Act. And he used two conservative outside special interest groups to help him vet these candidates. And then when they settled on Brett Kavanaugh, it turned out that he had the longest paper trail of any nominee in Supreme Court history. Mitch McConnell even warned against Trump picking him for that reason. Trump ignored that advice and picked him anyway. And when it turned out that the archives said we weren't going to be able to produce all his materials until late October, Senate Republicans and the Trump White House said eh, we'll hold the hearing on September 4th anyway. And as a result, there's 3.5 million pages of documents that are being concealed that senators have not seen prior to this hearing getting underway. At this point, you have to sort of ask, what's the point of even Democrats showing up? If I were them, I'd consider walking out of the hearing tomorrow. You cannot act like this is business as usual. As Amy Klobuchar said in that clip that you just played, this is not normal. I think Democrats need to respond in kind. Otherwise, they risk lending legitimacy to a process that is fundamentally illegitimate. HEWITT: All right, so Dr. Arnn, there's so many things wrong with that statement. But I'll let you pick which one you wish to illuminate. ARNN: I think this guy's against Kavanaugh. HEWITT: You are the president of a college for good reason, sir. ARNN: Yeah, that's right. I get down to the point. Yeah, so it's actually true that the difference in the way Trump has done this and the way others have done it is that he advertises some broad criteria-- because that's what they are. Gut Roe v. Wade and gut Obamacare, that's not the language. He emphasized that these would be people who would preserve the rule of law and the original meaning of the Constitution. But then, what's different about Trump is he put that in front of the people, including with a list of such judges. Not the ones he would pick, but such judges. In other words, he made it the most public-- that is to say, accountable to people process than it's ever been. HEWITT: I got him on this radio show saying if he departed from that list-- which was a long list-- the Senate should not confirm his nominee because he was making a contract with the people about that list. And they added Brett Kavanaugh later, subsequent to the election. And if I were the Democrats, I'd be focusing on the fact that he campaigned on a promise to select from that list, and he added Kavanaugh later to the list. But they haven't done that. Instead they're using these idiotic talking points, which I don't think persuade anyone. Do they? ARNN: Well, people have a sense of humor, right? They're not shocked to discover that there is partisanship in Washington, D.C.
ARNN: This is not the first time this has happened. So this outrage can be sustained, I guess-- you're the one who knows now-- on MSNBC. But I don't know that it can be anywhere else. HEWITT: That's what Ben Sasse said last night, which was so brilliant. He said, "our whole politics has been contorted by 24-hour cable, which is watched by 1% of the American public." Three million people watch cable, maybe 6 million on a big day, 2%. And Ben Sasse decried that the senators will be asking questions with the intent of gaining airtime on those cable channels. He's right about that. ARNN: Isn't it funny how the-- see, the big media, right? It doesn't reach that many people. But it's also true that the big mainstream newspapers are lusting to be more like CNN. So there's a play. Let's say there's a big newspaper I respect. And one time I was talking to some of the people I respect the most. And they said-- you know, I actually took some things, and I read some things they had written to them, because I admired them a lot. And, you know, I said, you were having a good day that day. And one of them said to me, but do you watch our TV show? I said no, no, I don't. ARNN: Don't bring that up. And they said, you really are old school. Aren't you? HEWITT: Well, that's because you can read a lot faster than you can watch or listen. That's the bottom line. And so if you are interested in argument, and conversation, and details, and data, you read. You don't watch or listen. HEWITT: You read. And Judge Kavanaugh has 300 published opinions, Larry Arnn. When we come back from the break, we'll talk about how much time those opinions will get versus what will actually be asked. And as this special edition of the Hillsdale Dialogue continues, don't go anywhere, America. Dr. Larry Arnn of Hillsdale is my guest. We will continue on this first day of the Kavanaugh hearings. I've got some more Brian Fallon quotes as well. Because we are fair here. We will give a fair shake to both sides. Welcome back, America. I'm Hugh Hewitt in the ReliefFactor.com Studio. We're having a special edition of the Hillsdale Dialogue on a Tuesday, as opposed to last radio hour of the week. Dr. Larry Arnn, president of Hillsdale College, is with me. All things Hillsdale are collected at Hillsdale.edu. Dr. Arnn, we're talking about Brett Kavanaugh. I want to play for you two senators speaking yesterday. Well, actually Elizabeth Warren from Massachusetts spoke in the Senate last week. And Ron Johnson spoke on Sunday on This Week with Martha Raddatz. Here is Elizabeth Warren of Massachusetts in the Senate hall last week. Cut number nine. WARREN: And so the big question is whether or not there will be just one or two Republicans who will be willing to cross over, and to vote against a candidate who has been pre-screened by two right wing extremist groups. HEWITT: And here is Ron Johnson of Wisconsin on ABC's This Week with Martha Raddatz. Cut number 11. JOHNSON: I think it probably depends on the case. But again, Brett Kavanaugh, an extraordinary judge. You know, a long record, 12 years, on the DC Circuit Court bench. Over 300 decisions. I mean, the Democrats have more than enough information to understand that this is a highly qualified jurist that should be the next Supreme Court Justice. In an earlier time, 30 years ago, he would have passed unanimously. It's unfortunate that Ted Kennedy began this process of very divisive confirmation battles for the Supreme Court. HEWITT: Now, Ron Johnson is correct, Dr. Arnn. Ted Kennedy started this with the borking of Robert Bork over 30 years ago. But I wonder if you agree with me maybe it's a good thing that he did? My friend Dennis Prager likes to say clarity before agreement. That assassination, character assassination of Robert Bork, set in motion a process where we have great clarity about what the court means. ARNN: Mhm. Well, it certainly is never a bad idea to provoke an open political debate. And so much of the government today is organized so that things are not decided that way anymore. First of all, we haven't said this yet. But it's worth saying. The Supreme Court is not the only, or even the final, authority over constitutional questions except as regarded to the parties in the case before them. And that's Abraham Lincoln. That's Alexander Hamilton. The whole reading of the Constitution, that's what it says. And so the truth is if you have an open political system, and you have debates, and you have elections, and that is the ultimate way that things get decided. So that's right, it's good that these guys went crazy. They do believe that whoever that guy was who is upset because there are 3 million documents and the Senate has not had time to read them yet-- you know, they can read all 3 million. Whoever that guy is, he objects to the fact that Trump let the people know what kind of people he was going to put up. HEWITT: And Elizabeth Warren said the same thing. They are objecting to the openness of the process. HEWITT: Chuck Grassley, by the way, responded specifically on the documents. So I want to play cut number seven, Adam, for Dr. Arnn and me. GRASSLEY: That 6% is of what the archivist said is possibly going to be a total number that would be available. But because of computer software, and the elimination of duplications, and for other reasons, there's a much smaller number. For instance, I originally said back in July there might be a million pages available. Getting rid of duplicates and for other things that you don't need, we have it down now to about 488,000 pages. HEWITT: Stop right there. So Larry Arnn, I know we're running out of time. It's a complete canard. I mean, everybody knows. He's got 300 published decisions. Everybody knows everything. I think the Democrats made a terrible choice in making this about document production. ARNN: Yeah, yeah. Because it's an established political technique, right? Fuzz it up, make the record obscure, say there's a lot of hidden things. But I don't think that's going to work, right? They're going to vote. And the clever thing, or the intelligent assault on Kavanaugh is an assault upon senators who might vote against him who are Republicans. And it is a narrow majority. And so they need to flip two or three. And they should be working on that. And they are. You know, part of the theater that will be this week will be so people can take polls, and congressmen can read their mail, and decide what people are writing in about Kavanaugh. So let's say the Senator from Utah who's not up for election this year, he's not going to be terribly impressed by that. But any Senator in a swing state who is up for election is going to pay attention to that. HEWITT: Yeah, that would include Bill Nelson, Democrat in Florida; Claire McCaskill, Democrat in Missouri; Heidi Heitkamp, Democrat in North Dakota; Jon Tester, Democrat in Montana. They are in deep red states. And they are in deep trouble if they oppose this. ARNN: Mhm. And maybe anyway. Yeah. And so, you know, it is a tremendous piece of political theater with constitutional significance. HEWITT: And we will talk about it again on Friday when Dr. Arnn returns for the regularly scheduled Hillsdale Dialogue, all of them collected at HughForHillsdale.com. Thank you, Generalissimo. The Ben Sasse conversation now posted, audio and transcript at HughHewitt.com. Thank you, Adam. Thank you, fans. Thank you, Dr. Arnn, all of you for listening. I'll be back tomorrow on the next "Hugh Hewitt Show."